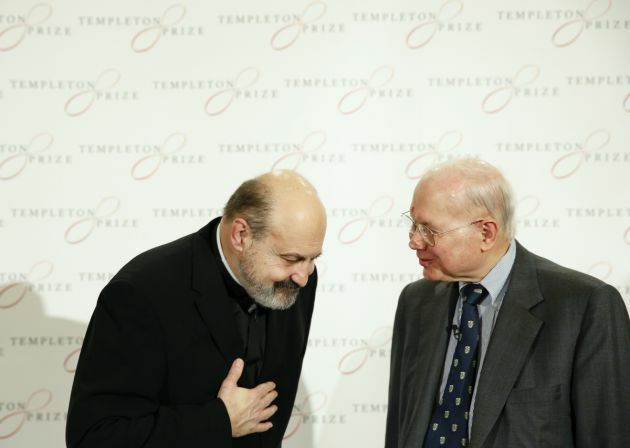 (Photo: REUTERS / Olivia Harris)Czech priest Tomas Halik (L) acknowledges Jack Templeton, son of John Templeton, the founder of the Templeton Prize, during the 2014 Templeton Prize award in London March 13, 2014. Halik, a Catholic priest whose theology of paradox invites believers and atheists to dialogue has won the 2014 Templeton Prize, worth .83 million, for his work affirming the spiritual dimension of life. A Czech Catholic priest who risked imprisonment for advancing religious freedom after the Soviet invasion of his country, and has since become a leading advocate for dialogue among different faiths and non-believers, has won the 2014 Templeton Prize. Tomáš Halík won the award for his "approaches to interfaith dialogue include proposing that the long intellectual tradition of Catholicism well positions it as a bridge among diverse Western secularism, traditional religions and Islamic culture," the Templeton Foundation says in a statement on its website. Valued at 1.1 million British pounds (about $1.83 million or €1.3 million), the prize is one of the world's largest annual awards given to an individual. It honors a living person who has made exceptional contributions to affirming life's spiritual dimension, whether through insight, discovery, or practical works. Condemned by the then Czechoslovakia's communist government as an enemy of the regime in 1972, Halík, 65, spent nearly two decades organizing and building an extensive secret network of academics, theologians, philosophers and students dedicated to cultivating the intellectual and spiritual underpinnings for the democratic State he and others envisioned. At the press conferences that announced the prize in London, England and in West Conshohocken, Pennsylvania on Thursday Halík announced that he will continue his efforts with the proceeds from the prize. "Today I enter humbly and with gratitude into this community of men and women whose first members included such saintly individuals as Mother Teresa and Brother Roger Schütz," founder of the ecumenical monastic Taizé Community. "There is one thing maybe that unites us all in spite of our differences. It is the idea that inspired Sir John Templeton's noble undertaking; namely, the awareness that it is necessary for the life of individuals and society constantly to cultivate the spiritual dimension. "The common dwelling of our civilisation would be cold and inhospitable were the fire of the spirit absent from it. "Reason is a great gift from God, and science and technology are among the pillars of our civilisation, but rationality without any spiritual and moral impulses from the depths of faith, could be a dangerous explosive." The full title of the award is the Templeton Prize for Progress Toward Research or Discoveries About Spiritual Realities. The prize was first given in 1973, and for a few years went to such notables as Nobel Peace Prize Laureate Mother Teresa, and American evangelist Billy Graham, Desmond Tutu and the Dalai Lama. More recently, the award has gone to ethicists, theologians and scientists engaged in the field of religion and science.